I wouldn't call it a chore. It's not the same as the routine maintenance stuff we do to keep the status quo — vacuuming the living room or mowing the lawn. I hear from Wealth Daily readers in email and on Twitter (@BritonRyle) all the time. And it's not a one-way street. With some of you, it's literally been years of sharing articles, insights, analysis, and investment ideas. This is gonna sound sappy, but engaging with Wealth Daily readers really does make it all worthwhile. Because at the end of the day, we're all investing for the same reason: to make our lives and the lives of our families better. And really, even after 20 years of doing this, I still learn something new every single day. When I was younger, I got burned jumping on news-driven rallies more than once. I just stopped playing that game. And it's because you have to know if that "news" is truly new or if insiders and big money have known about it all along. That can be tough to determine on the fly. I tend to just not play this game. The flip side to this is that trends almost always take longer to play out than you think they will. Like, how long have we been talking about the cloud? I swear it's been 10 years. And yet the transition to the cloud is still a thing. It's driving Microsoft earnings. And IBM recently posted its first good earnings report in five years because of the cloud. Honestly, I'm a little slow sometimes. It wasn't until 2015 that I had my "a-ha" moment with the cloud. And I had already recommended a data center stock to The Wealth Advisory because I could see the trends for data traffic. In fact, it was while watching that stock (currently up 243% with a sweet dividend) that I finally understood the whole "cloud" universe. That realization led me to another 260% winner in Twilio (and we've only got 18% on it now, but I think our December recommendation is another huge cloud winner). Yes, it's another "oil demand" chart. But this one is different than any you've seen before. Most of these types of charts show you that oil demand will peak in the next few years, maybe five years. Not this one. 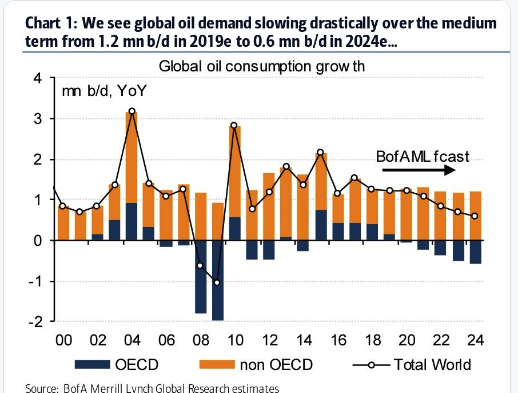 According to this chart, which is from Bank of America Merrill Lynch about a week ago, oil demand growth has already peaked. According to these analysts, the world will use less oil next year than it did this year. And less in 2021 than it did in 2020. This is completely new. Now, a lot of the big money is already preparing for this... and has been for years. Exxon's been buying more natural gas; Saudi Arabia wants to sell its oil company; Ford is making dramatic changes to its line of cars; GM and TSLA have the same market cap, $54 billion, yet GM does $147 billion in sales and TSLA does $21 billion. There’s a common misconception about insider trading out there, and it’s keeping investors from learning how to use EDGAR, a powerful moneymaking tool. Wealth Daily editor Samuel Taube sheds some light on the system. Rumors are flying that Google has a new M&A target. 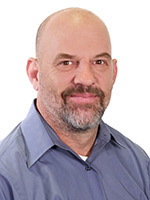 Wealth Daily editor Jason Stutman explains why the buyout would make perfect sense.